weather, well not so much. was happening high above us on Manaslu. But then around 5:00PM on Friday, Russell Brice paid our camp a visit. an orderly climb through the four camps and summit on September 25.
to 7 days. We were back on!! of the snow, repair a fallen ladder and break trail back to camp 2.
the route for summit bids. then leaving for the summit in the early morning hours of September 25.
day depending on weather and health. setting a difficult goal and getting close. safe summit attempt. We are all in excellent health and better spirits. reach that goal without putting Passang, my Sherpa partner, in danger. Congratulations, Alan. With your incredible training schedule, positive attitude and great support team, I’m not surprised you were successful. Can’t wait to read more about it. The first climb to Camp 2 sounded tough. 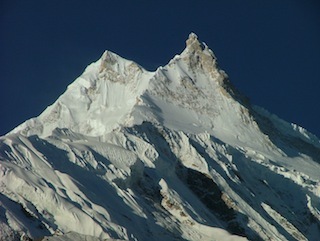 Probably too late to ask now but it would be cool to see Himlung from your vantage point at Camp 4. Very impressive. The fire is burning in me, I can assure you. Good luck with the summit push. Fingers crossed the weather holds. If you make it to the fore summit, the main summit will be fine! Climb on, Alan. You can do it !! !